Bleed is back in a short but feature-rich sequel. 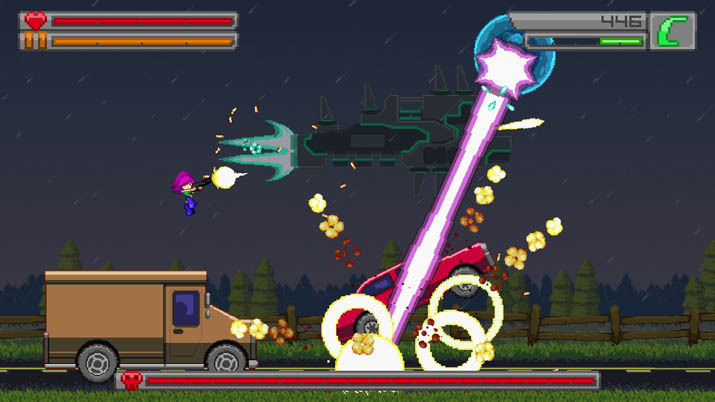 Those who played the 2012 release are in for some more action, playing the pink-haired protagonist, Wyrn, and saving the world in her good company, one boss at a time. To everyone else, welcome to Bleed 2, another side-scrolling bullet hell with tons of non-stop fighting, and in which you get to play the only hero left to save everyone from… Well... Villains. What else? An original premise? Absolutely not. A satisfying game? Yes, very much so. 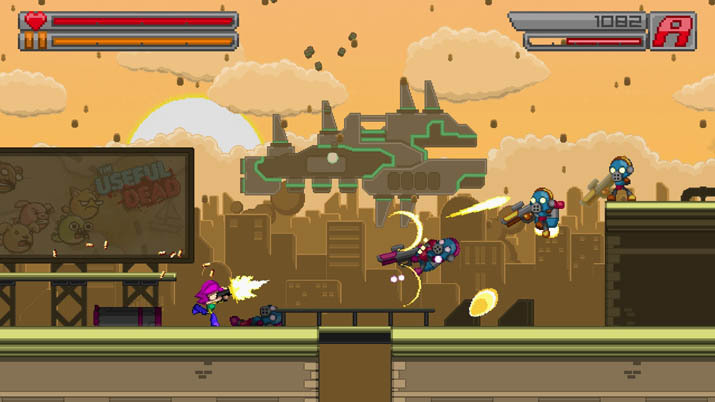 Bleed 2 has 25 boss fights packed into a handful of levels. You fight from a variety of settings, including trucks and outer space, and of course, to save the world from total destruction. 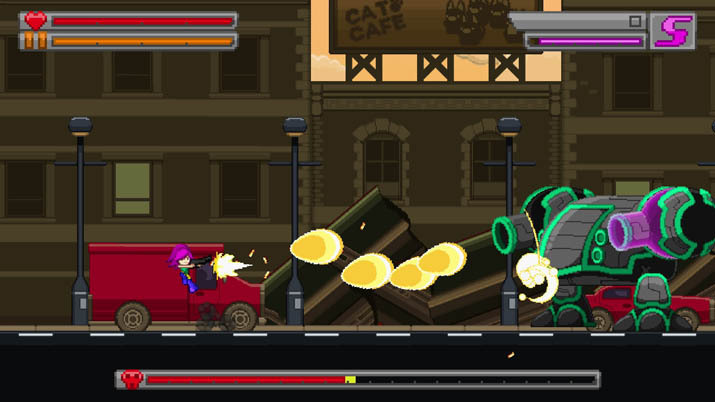 If you’re a fan of Shoot’ ‘Em Ups, you’ll find what you’re looking for: unlimited ammo, frenetic shooting at crazy speeds, bullets in every direction, and intense air-dodging to deflect incoming blasts away. 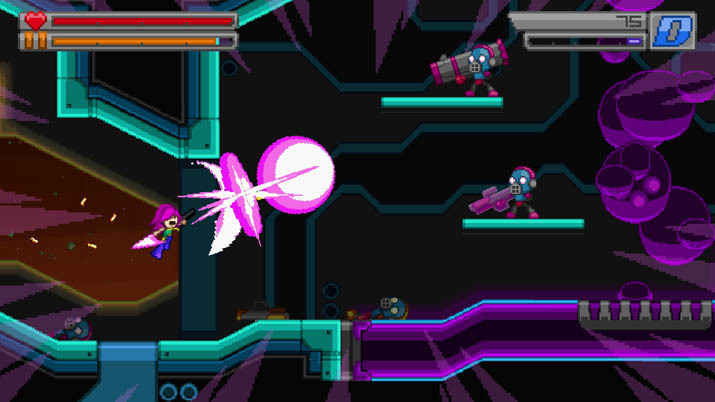 You’ll also find that each level has its own way to be completed and each boss their unique ways to be destroyed. Thankfully, you’ll come across a variety of characters to help you along the way, each with sets of abilities, some who are particularly useful when in need of solid dodging. You’ll also experience a scenic game, and more importantly, an arcade game that, while action-packed, is soft on the eyes. Sound level design, or the everlasting challenge common to fast-paced Shoot ‘Em Ups, here is made possible by backdrops or still frames to mitigate the chaos everything else generates. In terms of weapons, they come in numbers but you start off with a katana and a pistol, along with the power to reflect back incoming blasts. The latter is a skill that not only weakens villains, it lets you slip away from all bullets present on-screen but for a split moment. These instances are crucial if you want to finish strong. Then is the music, that complements combat beautifully while providing the nostalgic melodies you’ll want to hear, should you be ancient enough to remember the great classics from the era of Arcade games. And if you want to play with a friend, Bleed 2 comes with the co-op feature and is controller-friendly. Nevertheless, such features are nothing to write home about. You might argue, and you’d be right, that the indie scene is flooded with these action-packed, local multiplayer, arcade games that offer vibrant colors, cute designs, and hastened gameplay. Still you’d also have to admit, upon playing Bleed 2, that its run and gun-fun is packed together in a tight and polished package, and if you’re an expert in the genre, you’ll also likely agree that, at least in terms of fluidity, its design does compete against some of the more respected side-scrollers on Steam. Frankly, a few minutes in-game is enough to appreciate that pacing was done right, and must have been a priority to its developer, Ian Campbell. He succeeded in making sure you would never be slowed down, if for the intended exception of controlling the flow of time as you shoot away. The core mechanic around which the game revolves. With only 7 levels, Bleed 2 does fall short for casual players. Sadly, you’ll finish faster than expected; I completed a playthrough in about an hour. From easy to very hard, difficulty settings will help mitigate this issue for the more insisting and persistent players seeking to lengthen their experience, especially considering this bullet-hell is focused on beating its bigger mobs. A well-implemented feature does favor the spirit of competition: rising to the top is pushed to the forefront of the game’s presentation through leaderboards, the feature being obviously implemented as a motivational factor toward replays, improvements, and perfection of performances on each level. So that you might rise to the top and be glorious. Don't worry about pronouncing "Zahid" wrong, everyone calls her "Zaza". She is currently a resident in the crazy city of Austin, TX, where she studies journalism and makes crepes at a local food truck. During her free time, you will find her indulging in shoujo anime/manga, writing random nonsense, and gaming until her fingers cramp.